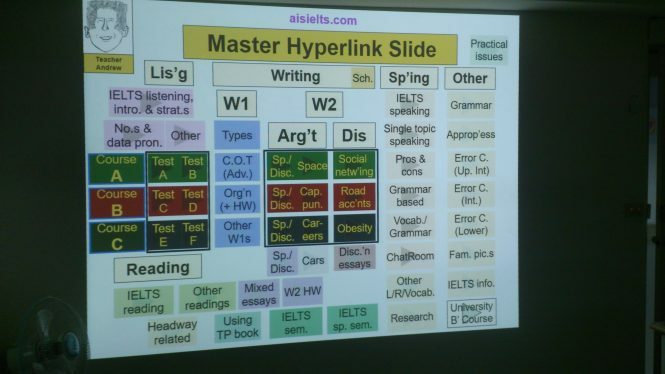 The above image shows the ‘Master Hyperlink Slide’ – which begins almost all of my lessons. 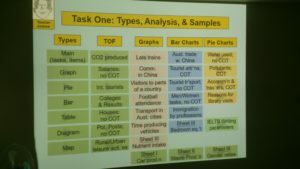 Notice the A, B, and C in the middle, reserving specific slides for Course A, B, and C, so that repeating students – those who decide to do another course – receive different input. 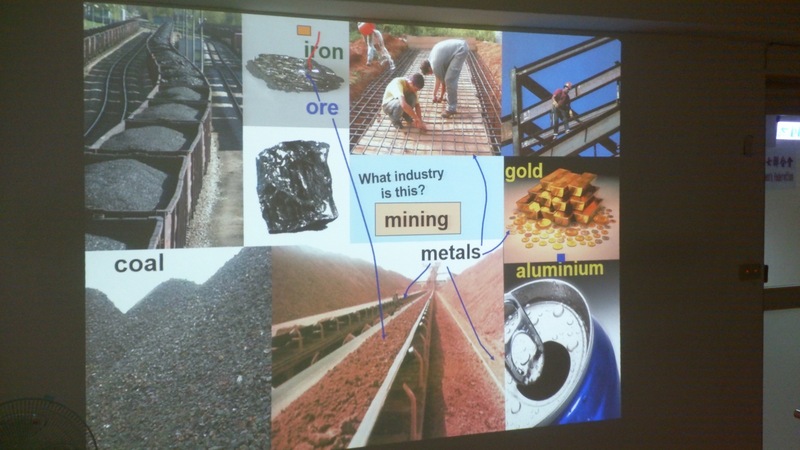 The ‘buttons’ on this slide open all the other PowerPoint programs/slides (including the ones shown below), which can open others, then others, providing an amazing interconnected teaching resource. 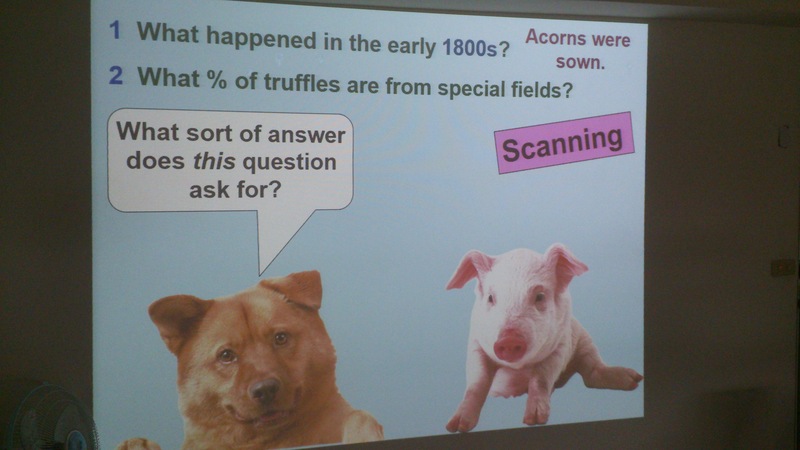 When you come to observe my class, you will see them in action. 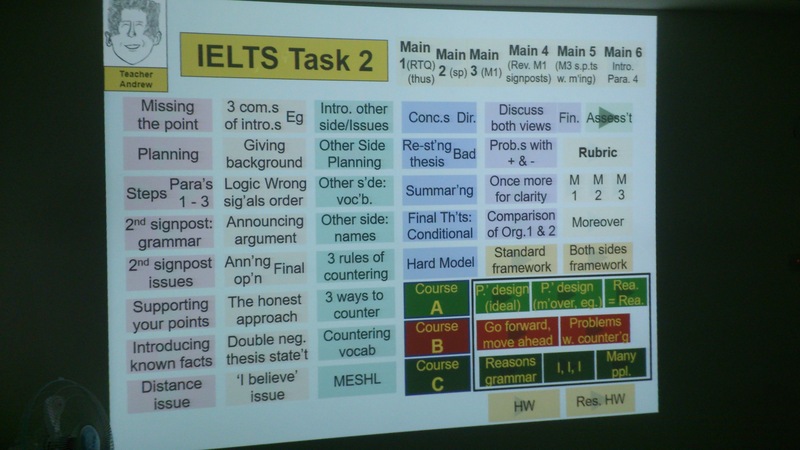 The teaching is totally directed by the most sophisticated, intricate, intensely programmed PowerPoint slides in the world, dedicated to one aim: preparing you better for the IELTS test. 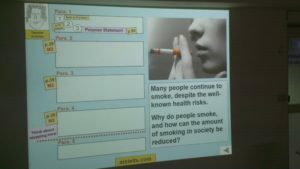 On this page you can see examples of the main ‘PowerPoint Index Slides’, and others. These, and the PowerPoint programs/slides they connect to are the result of over 12 years of constant work: creating, updating, adding, improving, and refining. 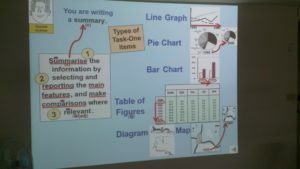 I do use a whiteboard sometimes (at the side of my classroom), but only for sudden, unplanned, additional pieces of teaching and instruction. 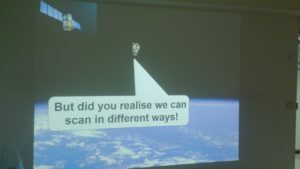 Generally though, it all follows the plan. 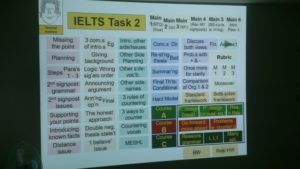 No time is wasted, and just a click on a button opens a specifically created teaching package, gently guiding you on the path towards IELTS success. 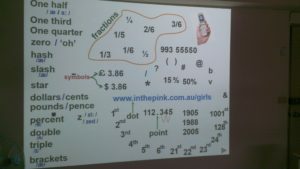 To repeat, no one in the world has developed a resource as sophisticated as this. 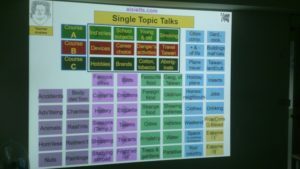 Look at the following pictures, and remember that every button on every slide index slide opens another slide (with more buttons), ultimately leading to a teaching program, covering absolutely everything! 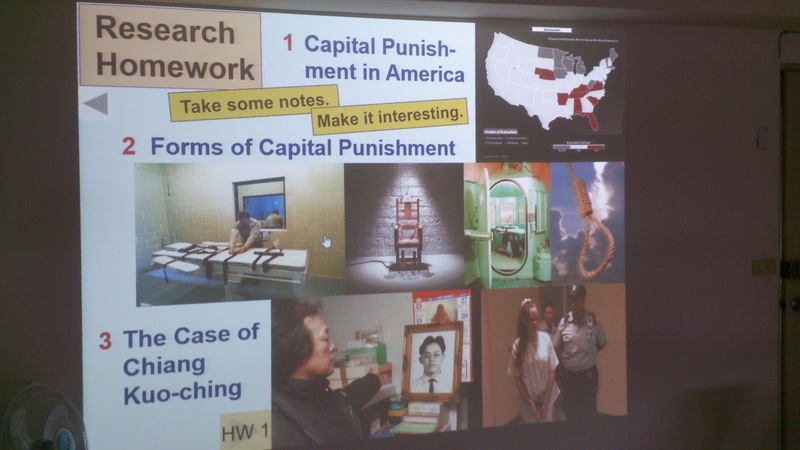 Click on the photos for a closer look. 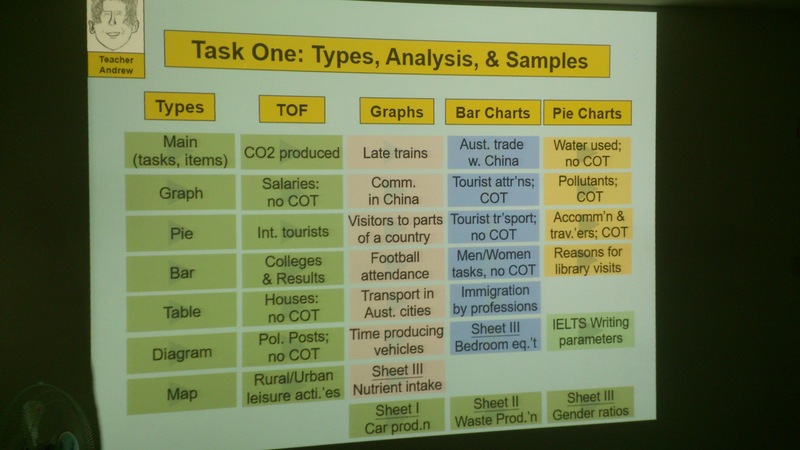 The different types of Writing Task One are analysed. 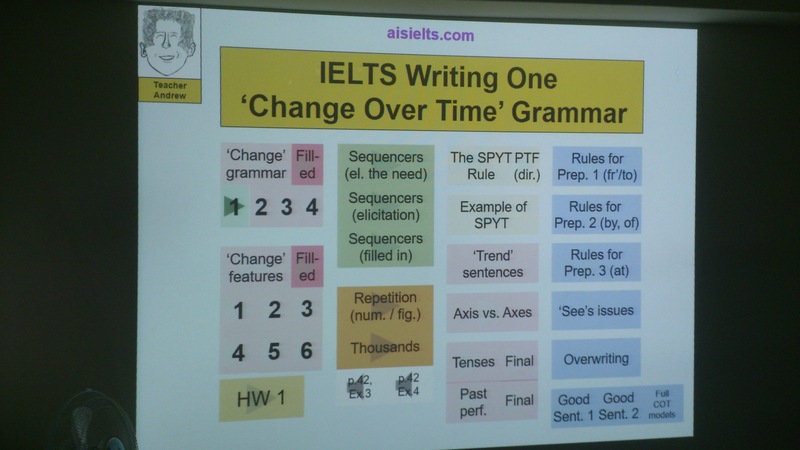 ‘Change Over Time’ is a common IELTS Writing Task One concept. 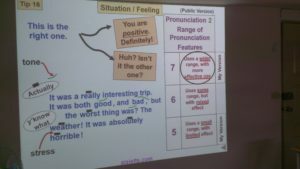 This PowerPoint deals with the grammar of this concept, including prepositions, word ordering, and tense. 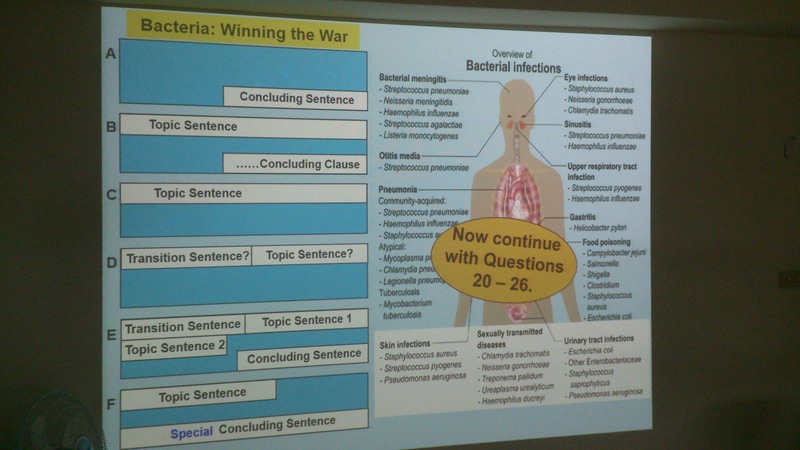 This program deals with the structuring and grammar of the whole Writing Task One. 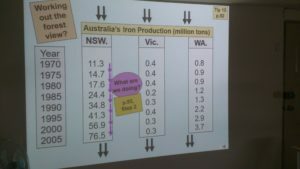 Working out how to analyse a table of figures. 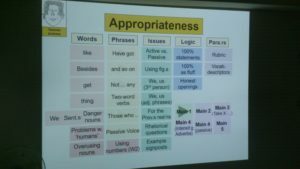 As you can realise now, there are many different types of items in Writing Task One, and this powerpoint deals with this issue. 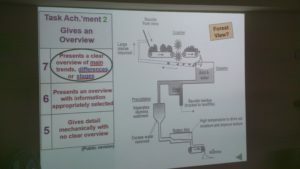 A Diagram Writing Task One is similarly analysed. 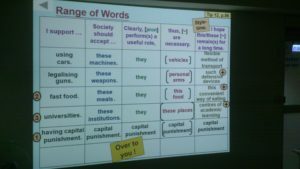 Getting into the details of ‘Change over time’ [COT]. 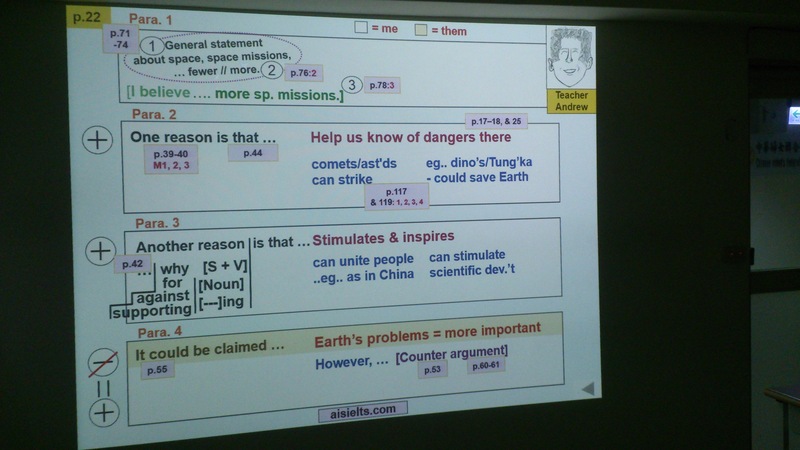 The structure of an essay can be carefully taught. Notice that I have put page numbers at various points, linking to the grammar/hints/models given in my IELTS Writing Two Book. 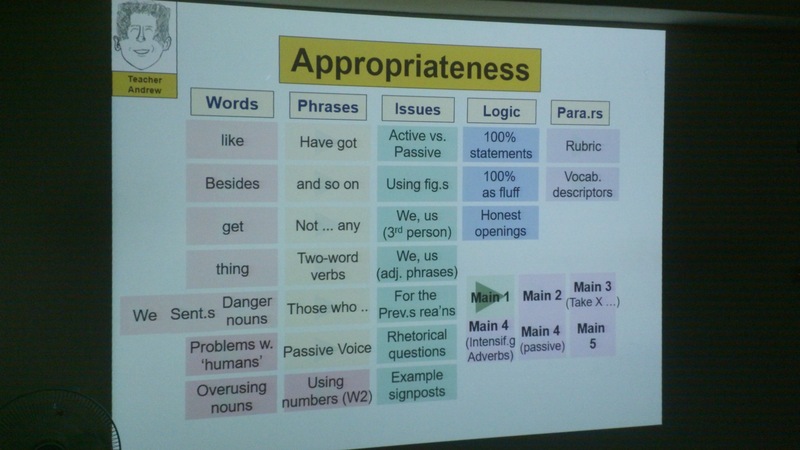 I have three versions of this slide (each with a different theme), so that students who repeat my Writing Course can have a different vocabulary and homework. 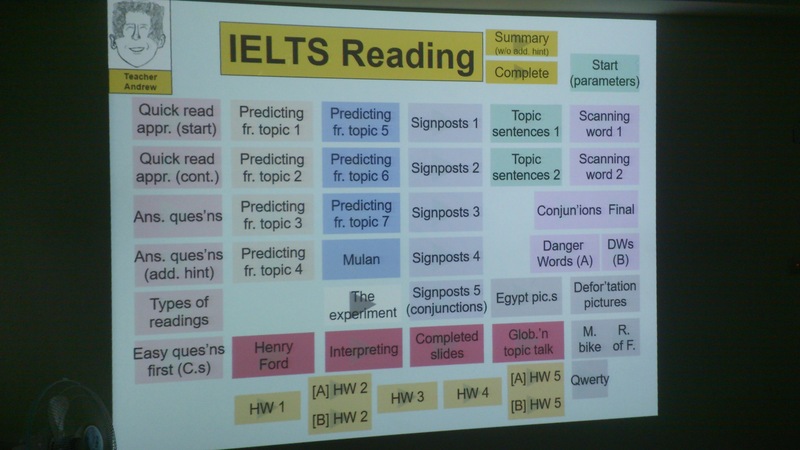 This is one of the BIG IELTS Writing Task-Two slides. 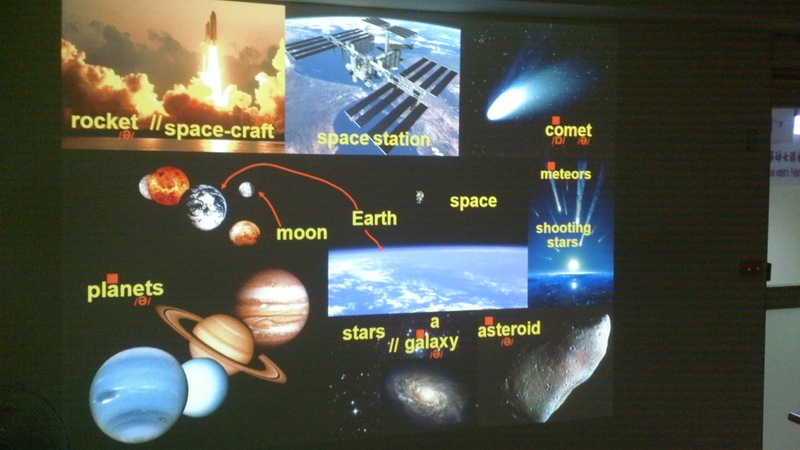 The three versions are A, B, C (as you can see). 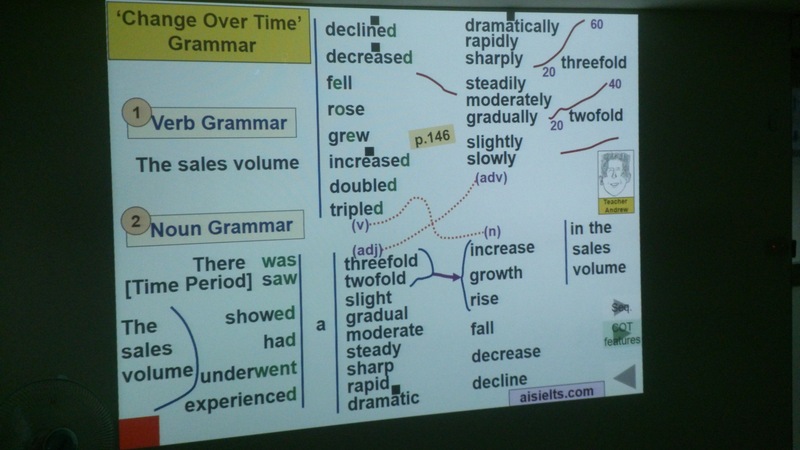 Vocabulary tips can also be given and practised in an imaginative and memorable way. 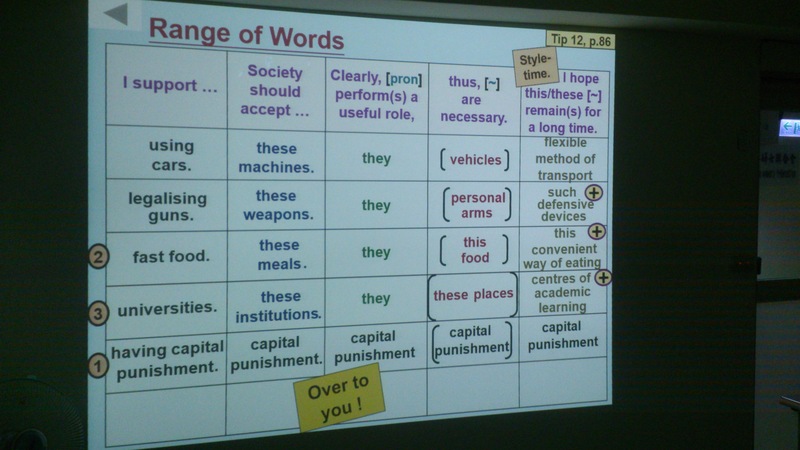 Suggested structuring of homework essays can be given. A few pages numbers indicate where to read to the structural signposts. 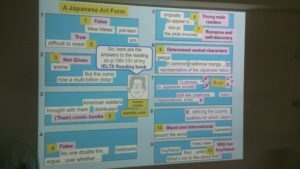 Research homework, to help with getting ideas. 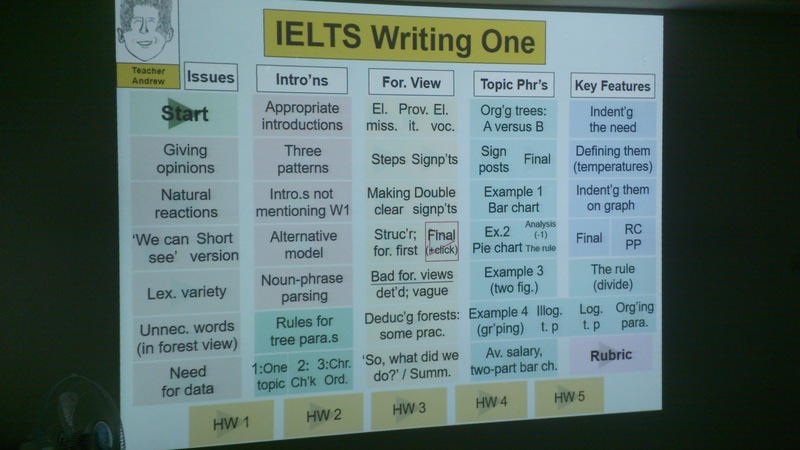 IELTS Writing is formal, and using a formal tone helps with the band score. 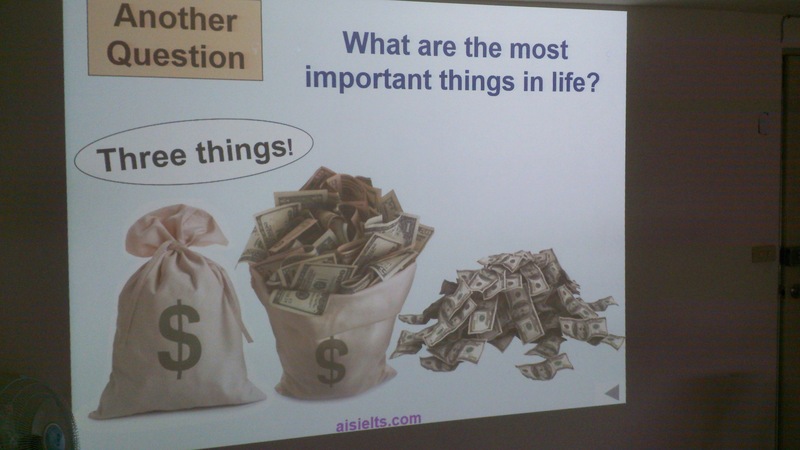 This slide deals with this issue. One of my most ‘programmed’ PowerPoints: dealing with ALL the typical grammar issues which students make in writing, both Task One and Task Two. 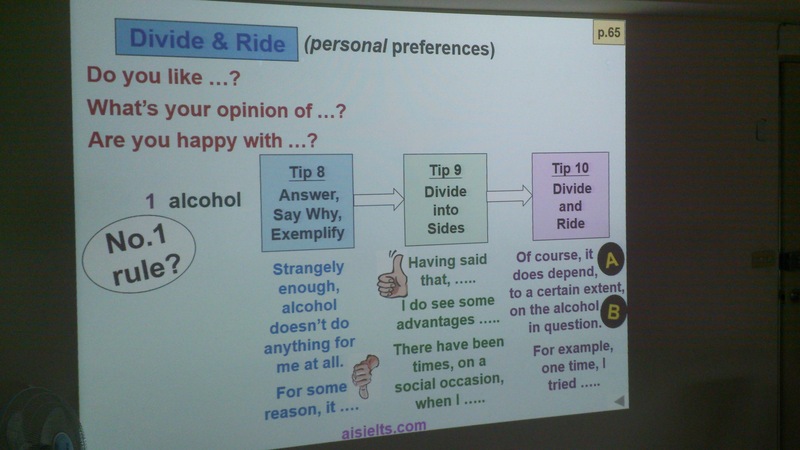 Notice again the A, B, and C, reserving different grammar input for different courses. 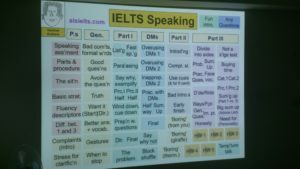 Speaking patterns to help you in IELTS can be analysed, and practised. 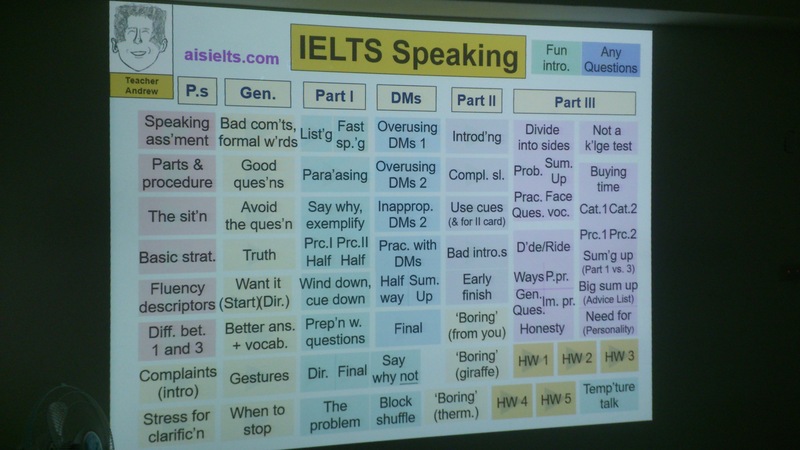 This PowerPoint covers IELTS Speaking, Parts 1, 2, & 3. 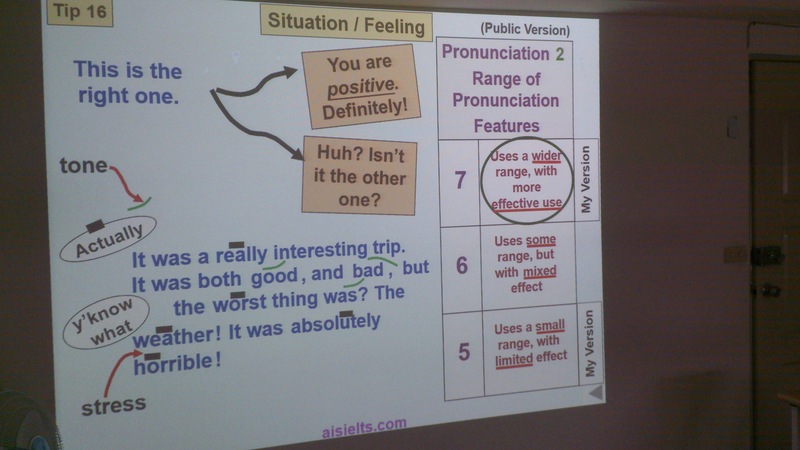 Pronunciation tips can be given. 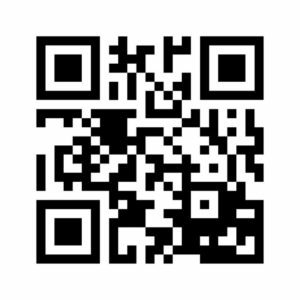 All tips lead to practice. 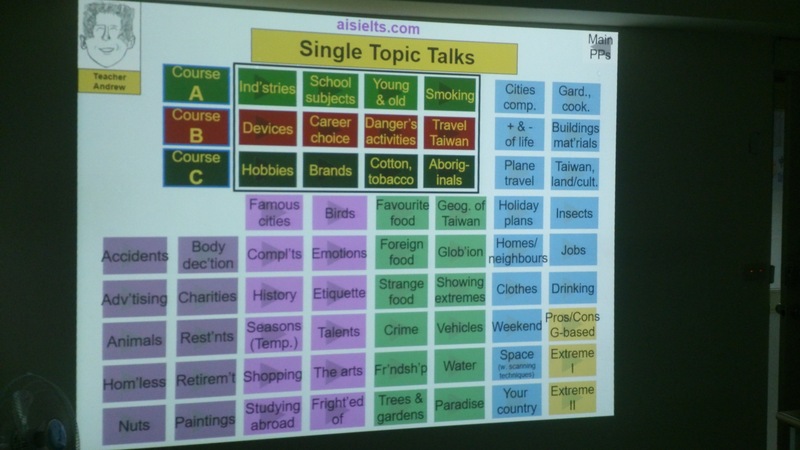 IELTS Speaking is topic-based; hence, this slide provides a huge range of ‘topic talks’, for practice. Again, there is the A, B, C, reserving specific ones for specific courses, allowing repeating students to receive different input. 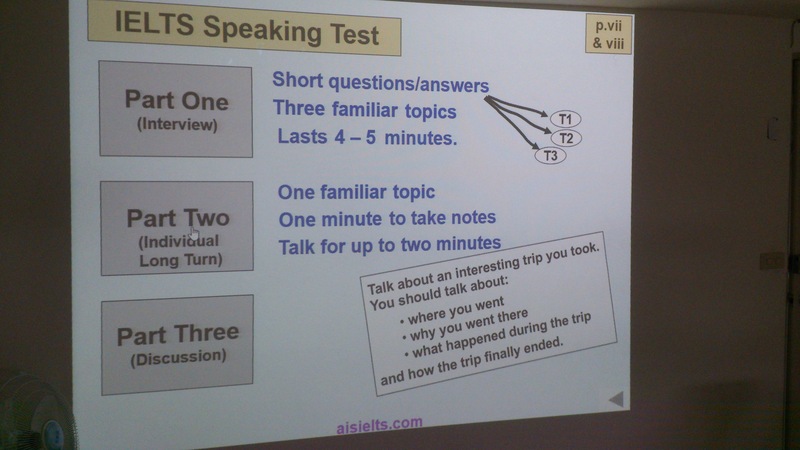 The structure of the IELTS Speaking Test can be analysed. 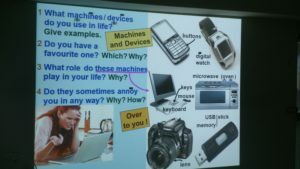 Knowing what to expect, and the procedures of the test, helps a lot. 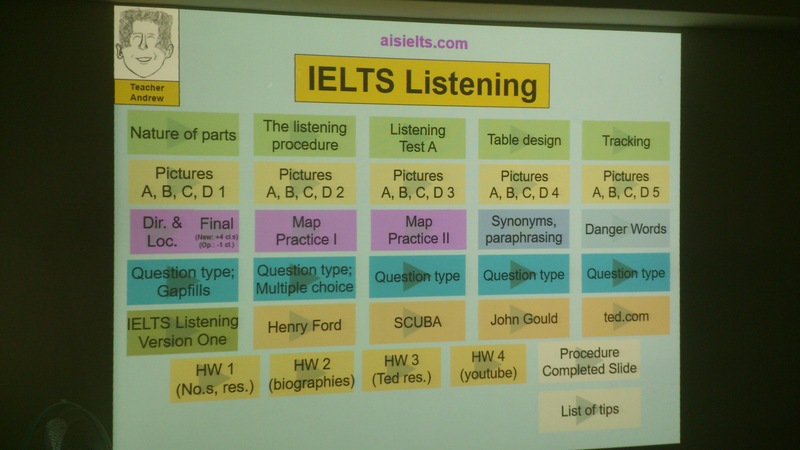 These are given in every IELTS skills: Listening, Reading, Writing, and Speaking. Sample speaking answers can be given and analysed. 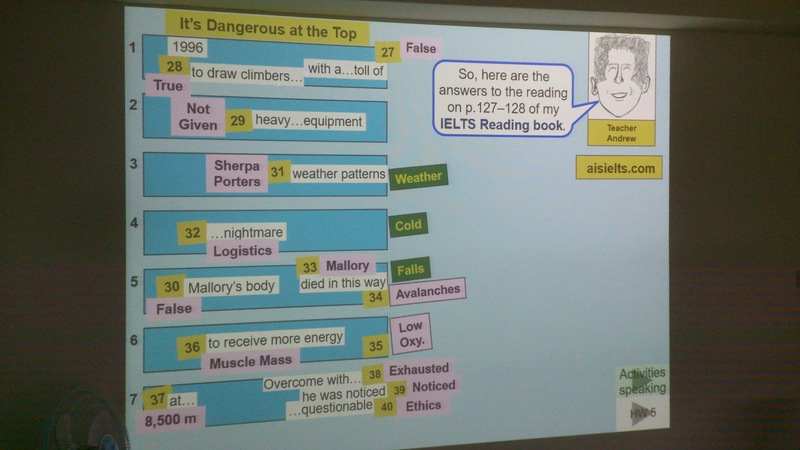 The Reading paragraphs can be carefully analysed. 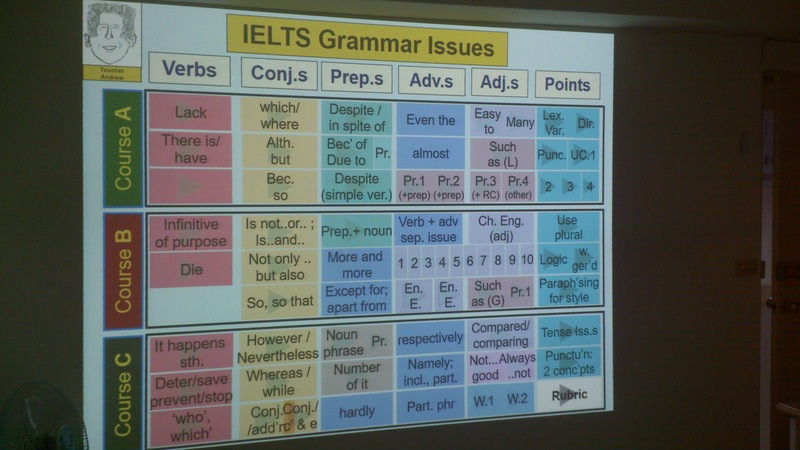 This covers IELTS Reading. 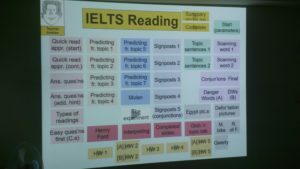 The Master Hyperlink slide (top of the page) can link to additional specific ‘reading’ PowerPoints, based on passages from the IELTS Reading book. 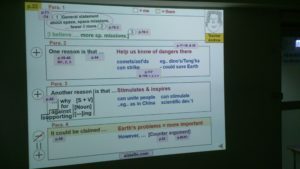 Again, answers to the Reading Passages can be efficiently given, and analysed. 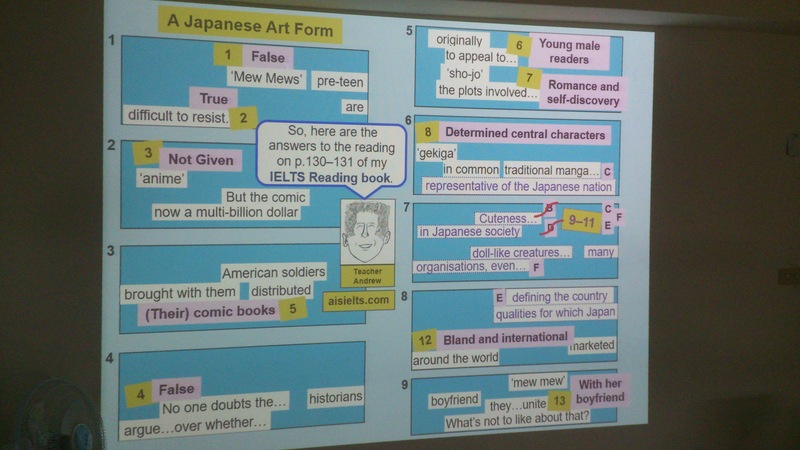 More Reading answers, given carefully one click at a time. Pronunciation of symbols and data are confirmed and practised. 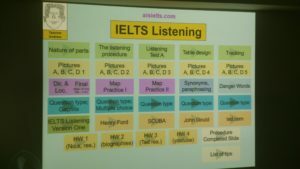 This covers all aspects of IELTS Listening. A speaking/vocabulary Powerpoint, on a very ‘IELTSy’ topic. 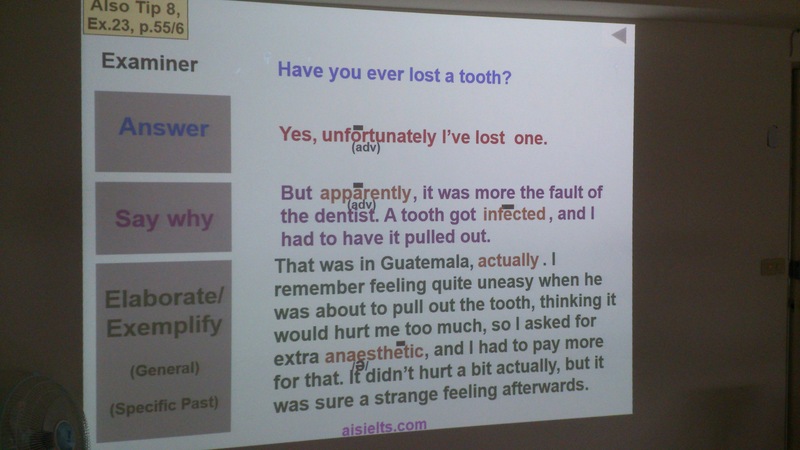 Again, a very ‘IELTSy’ topic. A good ‘topic talk’ powerpoint for IELTS Speaking. A powerpoint which sets the theme for IELTS Writing Task Two. 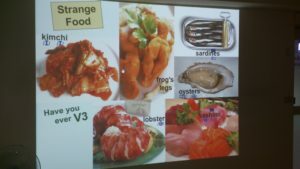 Food is a common subject to talk about, and making it ‘strange’ makes it more interesting, right? 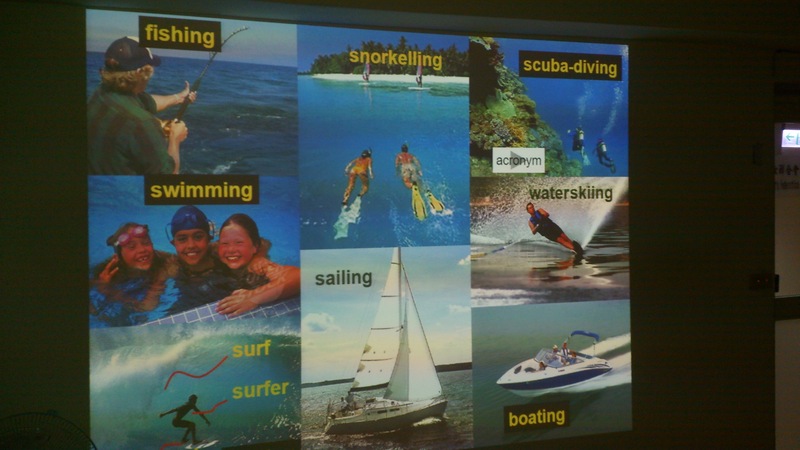 Have you ever thought of all the things we can do in water? 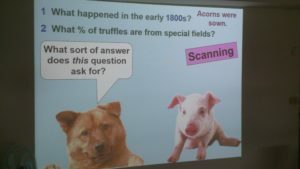 Creativity, Talking Animals. 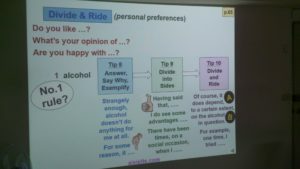 Another two students (males) are chosen for these roles. Creativity, Talking Camels. 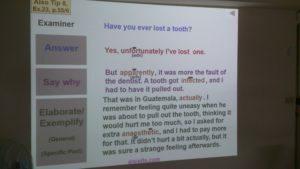 Selected students have to provide the voices. 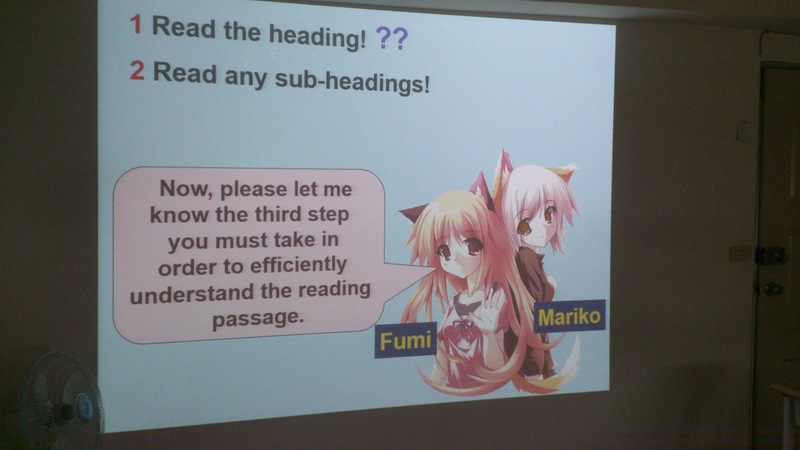 Creativity, Talking Manga Girls. Now the girls get a chance to play the roles. 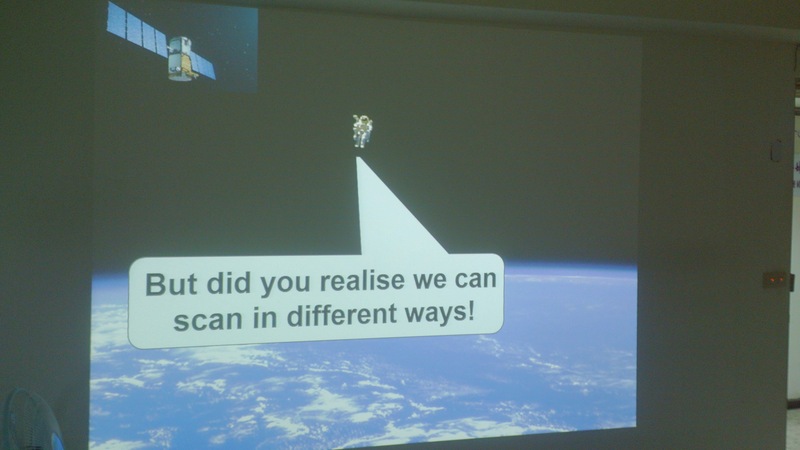 Jokes are used regularly in my studio. 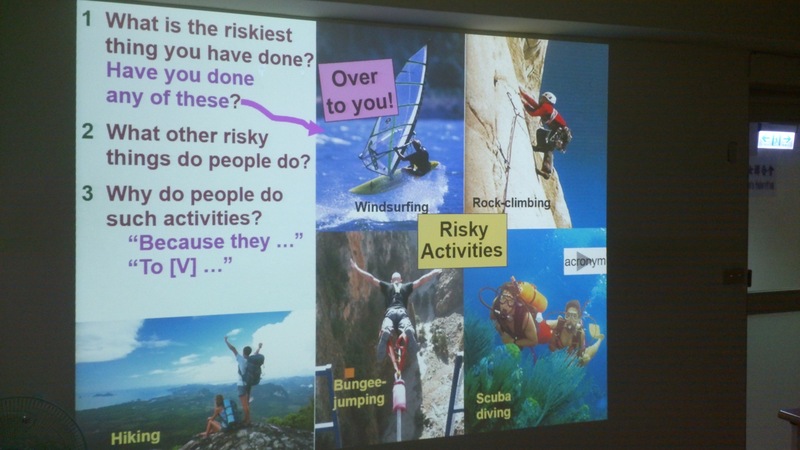 A fun class is a happy class, and feeling relaxed helps you learn better. 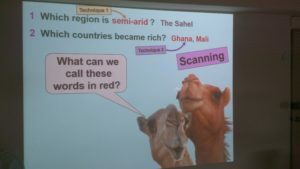 All the research proves this – and I’m a Cambridge Teacher Trainer, remember? Come to the class, and laugh along with your classmates.